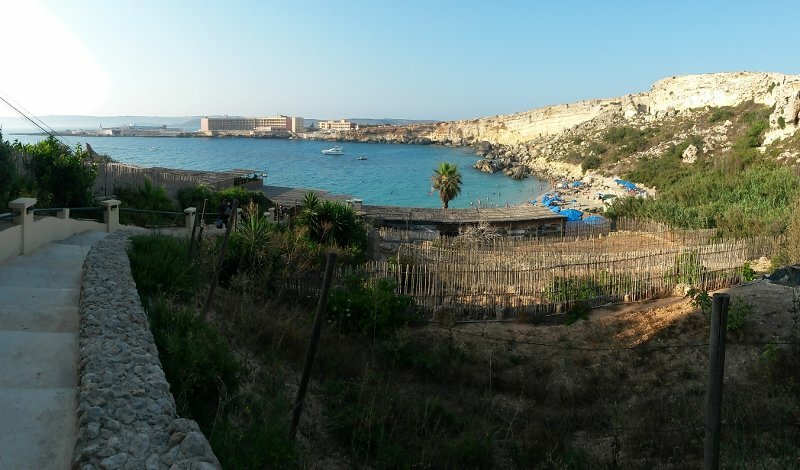 Paradise Bay is located at northwest Malta near Cirkewwa, and has two beaches. One at the hotel and one at the other side of the bay, which is Paradise Beach, a magically beautiful sandy beach. While you’re getting closer and closer it just traps you. You can reach it either by car or bus. If you go with car, before getting to Cirkewwa Ferry Terminal and just before Paradise Bay hotel take a 90 degree left turn. 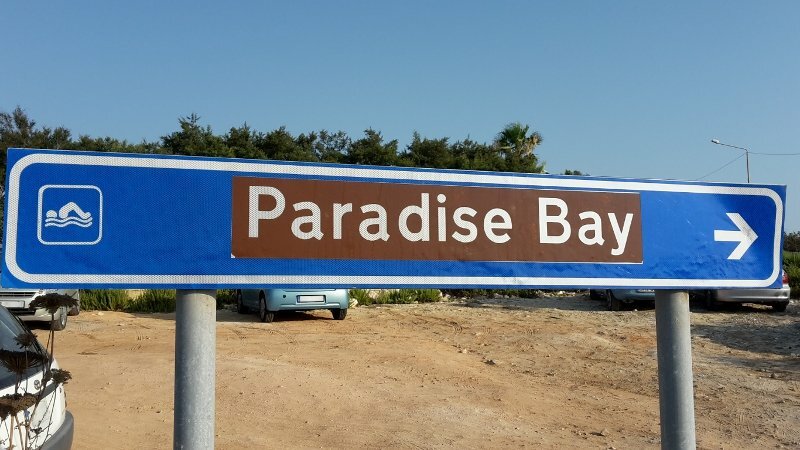 From there the road will lead you to the Paradise Bay parking area, just go straight ahead. If you choose to go by bus, be prepared, that after you get off from the bus, there is a 1 km uphill walk ahead of you. Get off at the Marfa bus stop and walk backward till the first road on the left. Now start your uphill walk. The bus 101 should take you to Paradise Beach parking area to skip that walk, but we just couldn’t find it, but also we don’t regret that walk, the view is just amazing. You can even see Comino and Gozo islands. We went on a Saturday and the beach – with its small sandy part – was very crowded, there wasn’t enough space to lay down, it was full. So if you plan to go there you should choose a weekday. Unfortunately to go to Paradise Beach you have to walk down on stairs, which why the beach is not accessible for persons with less mobility, like many other beaches at Malta. Restaurant is at the beach with large selection of food. When we arrived they just made paella in a large pan. There is a roof over the restaurant so you won’t get burn while you are eating or waiting for your food to be ready. Other facilities also can be found – like toilet – and when you go up on the stairs you can even wash off the sand from your legs. Paradise Beach was the only one at Malta where we saw something like that. Jelly fish nets were installed across the bay to protect bathers. If you swim outside of the nets, Paradise Bay offers excellent snorkeling, but don’t be shocked if you meet jelly fishes. They are so beautiful, but I’m terrified of them. The water at Paradise Beach is crystal clear and its color, so nice, you can see it on the picture below. A little bit colder than at other beaches we were at Malta, but it’s bearable.